Richard Green has lent two important paintings to the Guildhall Art Gallery’s exhibition, ‘Seen and Heard: Victorian Children in the Frame’, now on until 28th April. During the nineteenth century, Victorian society began to view youth in a different light. Traditionally seen as small adults, children came to be regarded with greater empathy and in need of special protection, regardless of class. And so the concept of childhood was born and this newly ushered age of innocence was a popular subject amongst artists. A Victorian panorama of English society, The General Post Office. One minute to six (1860) by George Elgar Hicks, is a masterpiece of modern life painting. A small replica of The General Post Office…, exhibited at the Royal Academy in 1860 (no. 367), now in the collection of the Museum of London, this dynamic oil on panel is set in the Grand Public Hall at the front of St Martin’s-le-Grand Post Office, built in the 1820s by Robert Smirke. 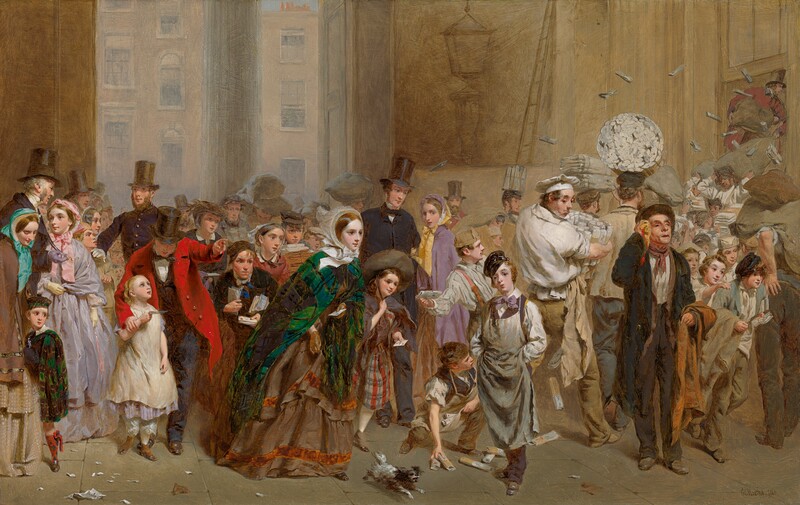 Full of detail and incident, capturing the excitement and bustle of the London crowd, this painting is an important record of the daily rush for the last post, the now demolished building and the costumes of the fashionable onlookers, metropolitan police, postal workers and newsboys of the era. In contrast, The swing (1865) by Myles Birket Foster, records a group of children playing joyfully by a water bank, their rural location providing them both sanctuary and an expanse of wide-open spaces to explore.